James P. Howe is an associate attorney with Godfrey, Leibsle, Blackboum & Howarth, S.C. Jim earned his law degree from the University of Notre Dame, and an M.B.A. in Finance, lnvestment Banking from the University of Wisconsin -Madison. Jim's law practice focuses primarily in commercial and residential real estate law, including real estate development sales. purchases, leases, and related general corporate practice. Jim has practiced real estate, general corporate law, and estate planning for over 30 years, representing real estate developers and other clients in annexations, rezones, land divisions, condominium conversions, easements, zoning enforcement and variances, as well as banks and borrowers in industrial revenue bond and commercial loans, issuers in private placements of securities for bank holding company and bank-related entities, and sellers and purchasers of businesses, among others. 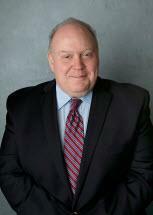 Jim is licensed to practice law in the State of Wisconsin and the State of Illinois. Jim is a member of the State Bar of Wisconsin and the Illinois State Bar Association.